Originally from New Zealand, Mary has lived in South-West London for twenty years. 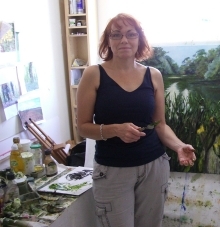 She studied BA (Hons) Creative Expressive Therapies and MA Art Therapy at Derby University. Her mental health training strongly influences the way she approaches the subject matter for her work and also the creative process. For the past few years she has worked with multi media such as coins, photos (examples can be seen in "Other Work") and more recently has returned to working with paint. Mary’s paintings are strong three-dimensional nature and landscape scenes. She works on large and small canvases in oil paint and mixed media. She sculpts into her work recycled materials which normally go into landfill and natural materials picked up on walks. She likes the thought that these objects are being given a new lease of life and enjoys the challenge of creating images that give the viewer the illusion of being able to step into a scene. Mary considers aspects and features of the landscape in a metaphoric and symbolic way. As with nature, we are never static but ever changing and evolving. She explores the sense that nature has a strong physical and emotional presence that often parallels physical health, emotional states of mind and life experiences, for example seasons and cycles, growth, burden, stagnation, death and decay.